Whether you drag, oval or road race, Moroso has the oil pan your engine needs specially designed for front or rear wheel drive sport compacts. Each pan is fully fabricated from aluminum or steel, with race proven features that control oil for maximum power. The key is to keep the crankshaft free of excess oil which allows the engine to spin freely and achieve its full power potential. Check out all the special features listed with their pans. Note : All Moroso steel pans are clear zinc finished. 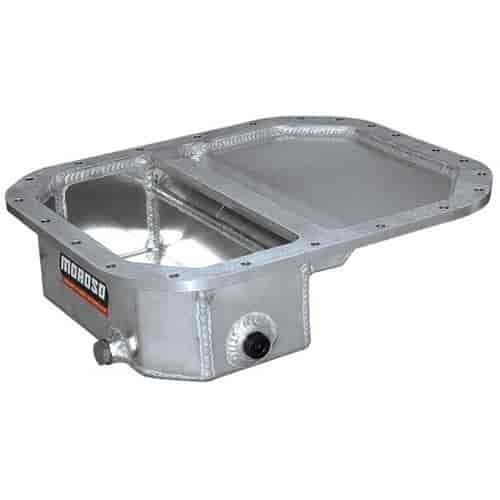 20942 - Moroso Sport Compact Oil Pans is rated 3.0 out of 5 by 1. Rated 3 out of 5 by buffalo from Good looking pan Nice pan but did not fit my 13B engine would be helpful if you noted this pan does not fit a 13B engines. Will this sump fit a series 4 rx7? ?